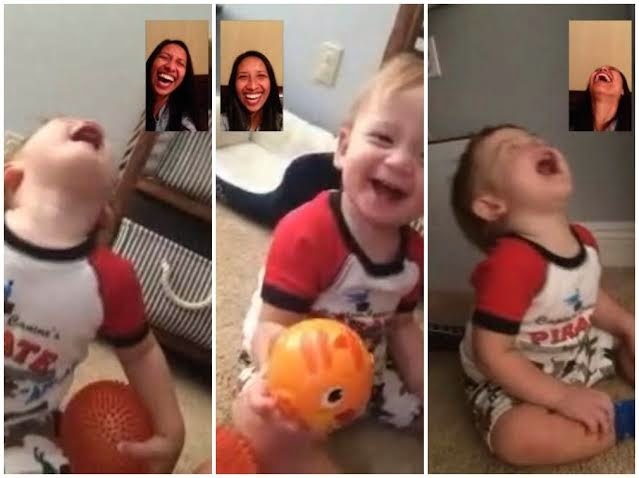 I FaceTimed with my sister and nephew this week, and it was a great way to spend a week night. Summer told him to say hi to his Auntie Lindsay, so I started talking to him. I blew kisses to him, and wouldn't you know -- his precious little self tried to kiss and hug me through the phone! It was the sweetest sight on the planet. I just love that rugrat! He is at the age where he mimics things he sees and hears. We spent a great deal of time going back and forth repeating after each other, and while that may sound so boring for an adult, it is exciting to observe a child engaging and learning like that! He said it just like you! He knows how to do the things he sees! He made something glaringly obvious to me that night. When I laugh really hard (which is a lot of the time I talk with Summer), I throw my head back. It's as if the joy is so strong that it can only shoot upward, not just outward. During one of our fits of laughter, we noticed that he smiled, tilted his head back, and opened his mouth. At first we thought, What is he doing? And then he did it again the next time he laughed. And then it hit me. He was imitating me when I laughed with Summer! Of course, that only made me follow suit, because we laughed so hard. (It's an endless cycle with us, this laughing thing!) I now call it The Peanuts Gang Laugh, because it reminds me of the Peanuts Gang characters when they laugh, sing, or yell. My nephew is now an official Peanuts Gang Laugher, thanks to me. The pictures are cracking me up! My friend (with a two year old) and I learned that real quick when we were eating pizza and maybe drinking vodka at her house and one of us unloaded an F bomb... and then a smaller of us unloaded the same F bomb.